Discussion in 'Free For All' started by Michael F., Oct 11, 2005. Between skyrocketing fuel prices and bankruptcy, commercial air carriers are facing a financial pinch of unequaled proportions. Carriers are looking at any and all ways to cut costs -- including maintenance. Slashing maintenance costs can have a shocking impact on safety. Demonstrating this is a recent bit of news that has yet to hit the mainstream media. This is scary for anyone who travels frequently by plane!!!! 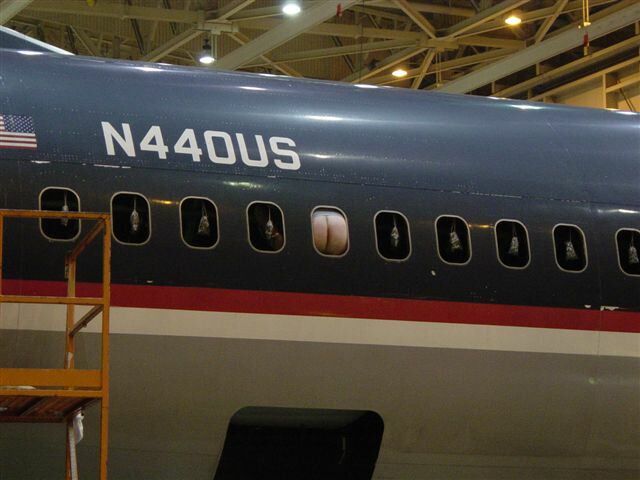 An actual crack was found in a USAir DC-9 window frame! Fliers beware of the substandard maintenance on the airplanes that you fly on. You won't believe this when you see it, this is an actual crack that was found in the window frame on a DC-9. This could have caused a major in-flight problem! I sent this to a friend in aircraft certification to see what action the FAA could take on this problem. I have refrained from posting the disturbing photo long enough, but you can click here to see what I'm talking about: Actual Crack In A USAir DC-9 Window You've been warned! Is that a union plumber? $112.30 to swim with the dolphins 30 mins??????? "In the sea of love where everyone would love to drown"
"And a memory is all that is left for you now"